Group of journalists and other professionals just arrived in Port-au-Prince on Sunday. Photographed here are, L-R: Larry Davis, dean of the School of Social Work, University of Pittsburgh; Ervin Dyer, co-trip leader and journalist; Germaine Watkins, photo journalist; Billy Jackson, documentary filmmaker; Allegra Battle, broadcast journalist; B. Denise Hawkins, co-trip leader and journalist; and Kim Davis, a retired banker (two other travelers are missing from the photo). 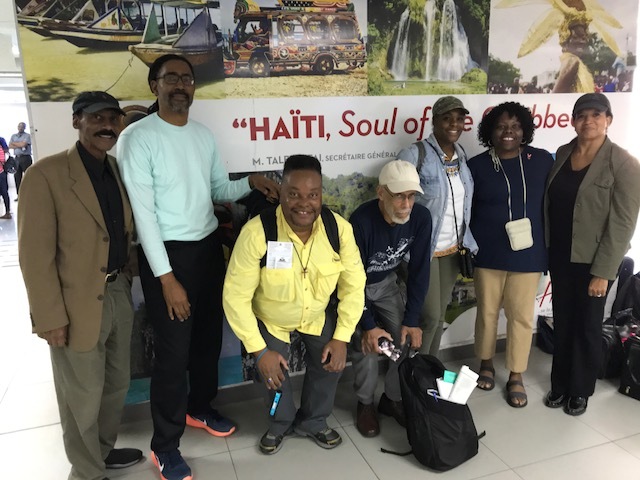 (TriceEdneyWire.com) - A group of African-American multi-media journalists and other professionals are on a cultural tour in Haiti this week. The nine-member group arrived in Port-au-Prince on Sunday, Oct. 28. The tour will include Port-au-Prince, which was hit with the catastrophic 7.0 magnitude earthquake which killed more than 100,000 in January 2010 and Gonaives which recently experienced a much smaller earthquake at 3.1 magnitude. The group will also travel to the cities of Jacmel and Cap-Haitian. The group is slated to return this weekend.